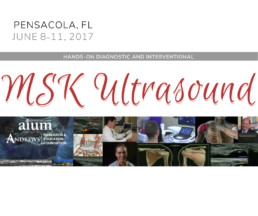 This course comprehensively reviews the application of musculoskeletal ultrasound for performing diagnostic studies and guiding interventional procedures in the upper and lower limbs. Expert faculty demonstrate the common pathologies and relevant ultrasound-guided procedures for patients presenting with regional complaints in the shoulder, elbow, hand-wrist, hip, knee, and ankle-foot. Core lectures are supplemented by faculty-supervised hands-on experience, both scanning live models and performing ultrasound-guided procedures on unembalmed cadavers. New this year, attendees will have the opportunity to scan with the expert and ask questions, while scanning. As a provider accredited by the ACCME, the AIUM must ensure balance, independence, objectivity, and scientific rigor in its educational activities. Course director(s), Planning Committee members, faculty, and all others who are in a position to control the content of this educational activity are required to disclose all relevant financial relationships with any commercial interest related to the subject matter of the educational activity so that the AIUM may identify and resolve any conflicts of interest before the activity. Disclosure of this information will be published in course materials, along with disclosure of any commercial support received for the activity. To receive discounted rate: reservations must be made no later than May 10, 2017, based on availability. The American Institute of Ultrasound in Medicine (AIUM) is accredited by the Accreditation Council for Continuing Medical Education (ACCME) to provide Continuing Medical Education (CME) activities for physicians. The AIUM designates this live activity for a maximum of 21.5 AMA PRA Category 1 Credits™. Physicians should claim only the credit commensurate with the extent of their participation in the activity. American Registry for Diagnostic Medical Sonography (ARDMS) The ARDMS accepts AMA PRA Category 1 Credits™. American Registry of Radiologic Technologists (ARRT) The AIUM is a Recognized Continuing Education Evaluation Mechanism (RCEEM) for the ARRT. This educational activity is approved by the AIUM for 21.5 ARRT Category A Credits. *During the breakout sessions, groups will be divided into thirds and rotate after 25 minutes to the next group (for example, if you start in the Cadaver Lab group, you will be there 25 minutes, and then, move on to the next group Learning Labs/Live Model group, and finally, to Ask the Expert group).